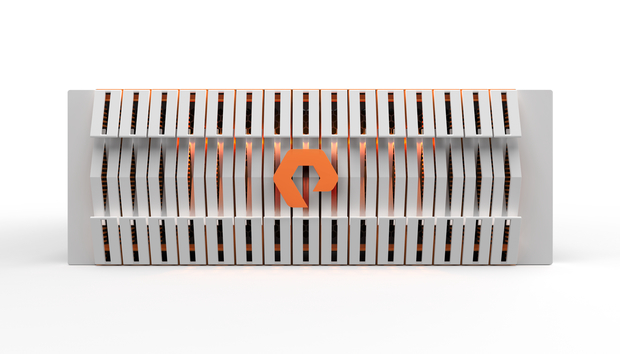 Pure Storage already lets enterprises buy new controllers for their flash arrays by subscription. Now it’s offering a way to trade in old flash media when new and improved versions come out. The program is an update to Pure’s Evergreen Storage initiative that could help enterprises keep up with data growth -- while helping an all-flash startup secure a long-term foothold in businesses. The idea is to ease the pain of storage upgrades and migrations in an age when companies want IT resources available all the time. Here’s how the new Capacity Consolidation program works: When an enterprise outgrows its last shelf of storage on a Pure Storage array and buys a new one, that one will probably hold a lot more data in the same size shelf because flash continually gets more dense. The buyer can then move the data from the old shelf to the new one, while keeping it available to users, and then trade in the old shelf to Pure. The trade-in covers the cost of whatever capacity on the new shelf is taken up by data that’s migrated from the old hardware. That way, customers don’t have to buy the same storage twice, Pure says. It's good for up to 25 percent of the total capacity of the new storage shelf. A technique called Shelf Evacuation ensures the data remains available during the migration from old to new flash. Pure is also introducing a program to make sure enterprises only have to buy the capacity they’ll really need after data-reduction techniques like deduplication have done their work. With the Right-Size Guarantee, Pure asks customers how much data they have now and how much they expect it to grow over the next six months. The company collects information about how well data reduction has worked on all its customers’ data (without viewing the data itself) and uses it to predict how much effective capacity the customer will really need in six months, said Jason Nadeau, director of product and vertical marketing. Instead of buying enough storage to hold all its un-reduced data, an enterprise can buy just enough for what it will have after data reduction, Nadeau said. If the customer runs out of space within six months, they can get the extra capacity they need at no additional charge.